Brian Breach, a Florida-based content creator, pretended to be homeless "to see who would help my family out during the holidays"
A South Florida man pretended to be homeless outside of a Target in Plantation, Florida, and decided to pay it forward to generous shoppers who stopped to give him change. A meaningful gesture became even more meaningful for some South Florida shoppers who offered to help a "homeless" man on Christmas Day. With dirt on his face and a cardboard sign that read "Homeless, just need a little help to feed my family through the holidays," Brian Breach appeared down-and-out to several shoppers outside of the Target store near SW 82nd Avenue and 3rd Street in Plantation. But Breach, a content creator and speaker, wasn’t actually homeless. His disguise was all part of a plan to give back. When shoppers stopped to help Breach, he handed them a crisp $100 bill in return. One man, he said, was moved to tears by the gesture. "He went on to tell me how he always gives back to the community and he truly believes that things come back to you for doing good deeds and it did," Breach said. Breach posted a video of the “Homeless Holiday (giving back) prank” on his Facebook page. "For Christmas I pretended to be homeless to see who would help my family out during the holidays," the video caption read. "Those who did got something in return. Always Pay it Forward!" 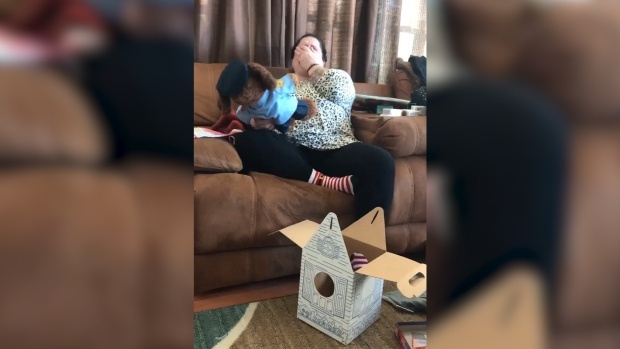 A mother was brought to tears after she received a teddy bear dressed as a cop with a voice recording of her late son. The video shows several instances of shoppers approaching Breach, asking him what type of food he needed or scrummaging for cash. In each case, Breach presented the kind strangers with a $100 bill. Breach, who has lived in South Florida since he was 13, said he saw a video that inspired him to give back. Within a few hours, the plan was in action. Breach said the experience was heartwarming and that he was glad he was able to put a smile on people’s faces during the holiday.